Knife banks for Dudley and Solihull are finished and ready. West Midlands Police and Crime Commissioner, David Jamieson visited the Ironworks last week, to solidify ongoing support in tackling the rise in crime. With all violent and aggressive incidents continuing to increase, the British Ironworks has vowed to upgrade its support being placed behind West Midlands Police. 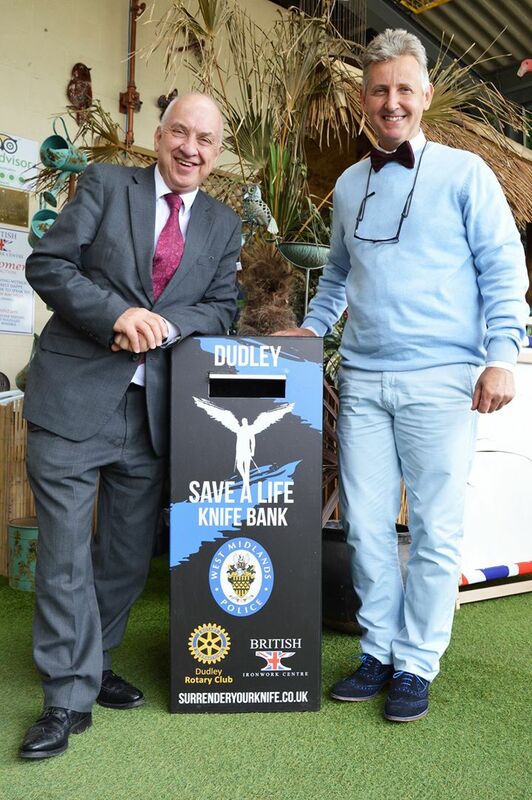 Going forward, the supply and loan of knife banks/bins is being reinvigorated for the West Midlands. David Jamieson seen here with our chairman Clive Knowles, presenting a commendation for efforts in supporting the force. “We’ve decided to further increase our efforts and support for West Midlands Police, they are a particularly proactive force, They have the support of a crime commissioner that is dedicated in turning this tide and decreasing aggressive and violent attacks. Crime affects all businesses and commerce, we think that we all have verifying resources and more of a need to step forward and help. Currently we are working on the creation of new pioneering Gun safe banks, these will also be offered free of cost and obligation to West Midlands Police.